Journey to the Center of the Earth was released in 3D in theaters and on anaglyph 3D (with those lovely red/green glasses) on Blu-ray and DVD back in 2008, but this release is for the better Blu-ray 3D. 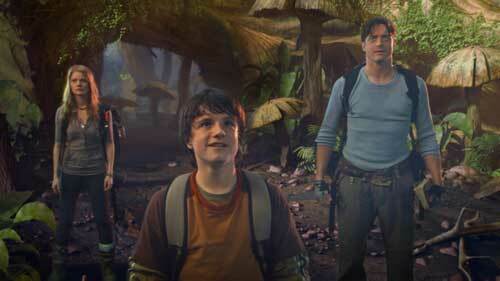 Based on the novel by Jules Verne , the 2008 science-fiction movie stars Brendan Fraser (Furry Vengeance) as a scientist who, with his nephew (Josh Hutcherson, Cirque du Freak: The Vampire’s Assistant), traces the last journey of his missing brother. They travel to Iceland and find a guide (Anita Briem, Dylan Dog: Dead of Night), but after getting trapped in a cave, they fall into a hole that leads them to a lost world in — you guessed it — the center of the Earth. Directed by Eric Brevig (Yogi Bear), the PG-rated action adventure film Journey to the Center of the Earth grossed $101.7 million when it was in theaters. The double-disc Blu-ray 3D release, which also plays on 2D high-definition Blu-ray players, includes “Movie Money” good toward entrance to another Warner movie in theaters. We’re thinking maybe William Tell, which reteams Brevig and Fraser and tells the story of the renowned archer and war hero who must rise up against Austrians invading his lands and threatening his family.